Well, the reviews of the Fowler have hit the newsagents in the UK. 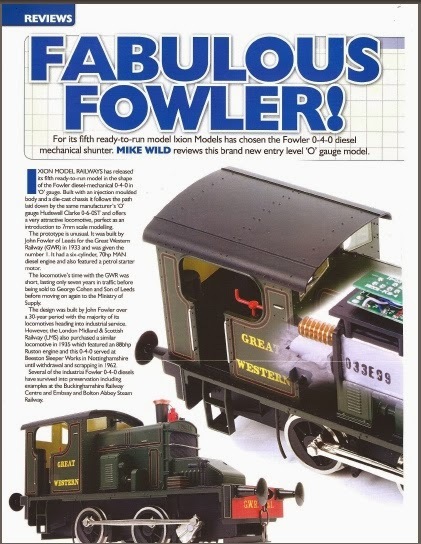 Railway Modeller, British Railway Modelling and Hornby Magazine have hailed it a triumph. Ixion has done an excellent job... On the track we found our sample to be both smooth and quiet [and] ...the result is a fantastic and unusual locomotive. If you have been contemplating O gauge for your next project this is a great entry level model. Quite honestly, so good is this model that I am hard pushed to find something wrong worthy of note. High praise indeed, which we humbly accept. Thanks to the magazines, and too our customers who have given us such positive feedback. I should also add that, for those of you reading this who are contemplating fitting DCC, the same issue of Hornby Magazine contains Paul Chetter's 4 page article about fitting DCC sound to the Fowler, complete with illustrations and a written guide outlining two separate methods of achieving this.